Surrey County Council’s Operation Horizon project has been praised at the Highways Magazine Excellence Awards. In the annual celebration of highways excellence, the county council, Aggregate Industries UK Ltd and Kier jointly received the Highway Partnership Award for its ongoing multi-million pound effort to improve Surrey’s roads. The premier industry awards were held in London on Tuesday. Go to the trade publication’s website for a round-up of the winners. A team from the County Council’s adult social care service has taken part in a poppy-planting volunteer day to commemorate those who have fought for our country. 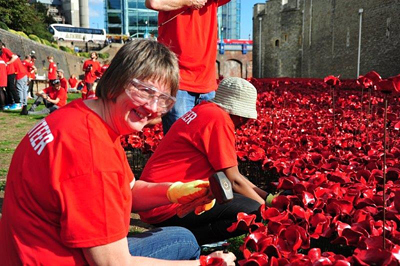 The Continuing Care Team planted poppies at the Tower of London in memory of those who fought and died in the Great War. It was a very personal event for many of the Surrey staff. Jan Gilpin said her grandfather, who was born in 1897 and served in the Essex Regiment, was plagued by the war for life and never spoke of it. Her grandfather’s story was a reminder of each soldier’s bravery and sacrifice, Jan said.